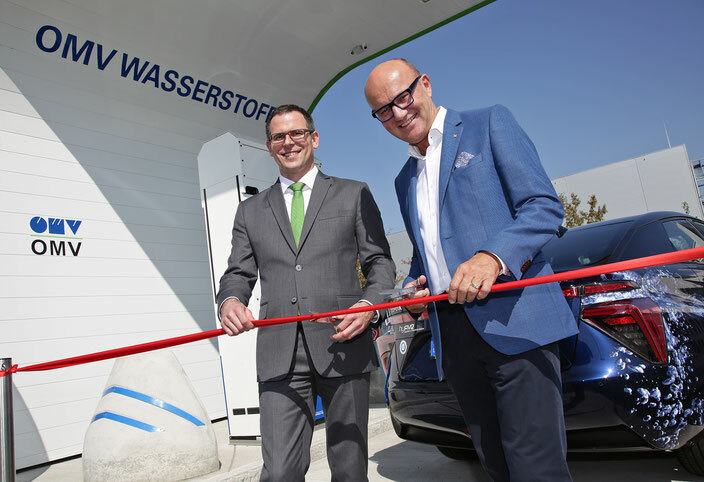 Dresden, 9/18/2018 The development of the H2 infrastructure in Germany is making good headway: Today, the first hydrogen filling station in Saxony was inaugurated at the TOTAL service station in Dresden on Wiener Straße. Dresden is one of the first 50 hydrogen (H2) service stations in Germany and an important contribution to enable eco-friendly electromobility for fuel cell vehicles. The new hydrogen facility was built by H2 MOBILITY with support from the European Union. Stefan Brangs, State Secretary in the Saxon State Ministry for Economic Affairs, Labor and Transport, was able to announce a further step in the expansion of the hydrogen network during the ceremonial first filling of a fuel cell vehicle: In Leipzig, the next hydrogen service station has already been completed at the TOTAL truck stop in Poststraße. The technology for the new hydrogen facility at the TOTAL service station in Dresden is produced by Air Liquide and has the refuelling capacity for up to 40 vehicles per day. The primary goal of the joint venture H2 MOBILITY, formed by the companies Air Liquide, Daimler, Linde, OMV, Shell, and TOTAL, is to operate 100 stations in metropolitan areas in Germany and along motorways and highways by 2019. Another 300 hydrogen filling stations will follow as the vehicle numbers are ramped up. 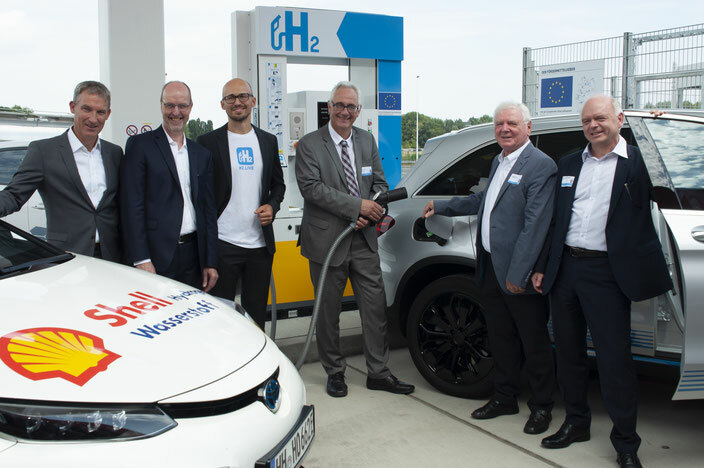 For the establishment of the hydrogen station in Dresden, H2 MOBILITY has received funding from the European Commission’s trans-European Transport Network (TEN-T CEF) within the project Connecting Hydrogen Refuelling Stations (COHRS). In the past years, the development of Germany’s H2 network had advanced significantly thanks to the Clean Energy Partnership (CEP), an association of industrial representatives of diverse sectors funded by the German government within the scope of the National Innovation Programme Hydrogen and Fuel Cell Technology (NIP). Within the framework of the NOW GmbH, the federal government is also an associated partner of H2 MOBILITY. Eco-friendly electromobility using hydrogen causes no local pollutants or CO2 emissions and, thanks to short refuelling times and long ranges, offers a high level of driving convenience. Fuel cell vehicles can be refuelled in under five minutes with enough fuel for a reach of up to 800 kilometers. "To become modern and smart, cities must develop sustainable mobility concepts. Hydrogen from renewable energies – preferably produced in the region – is certainly a key technology for the electromobility of the future. Therefore, I am pleased to see that the white spots on the map in eastern and central Germany are slowly becoming smaller and that there are more and more public hydrogen filling stations. Because the establishment of a dense European network of hydrogen service stations is the basic prerequisite for more people switching to this type of drive." "As a pioneer in our industry, we have been active in the development of hydrogen mobility in Germany for 16 years. All the more reason for us to be pleased that the expansion of the H2 service station network is gaining momentum. 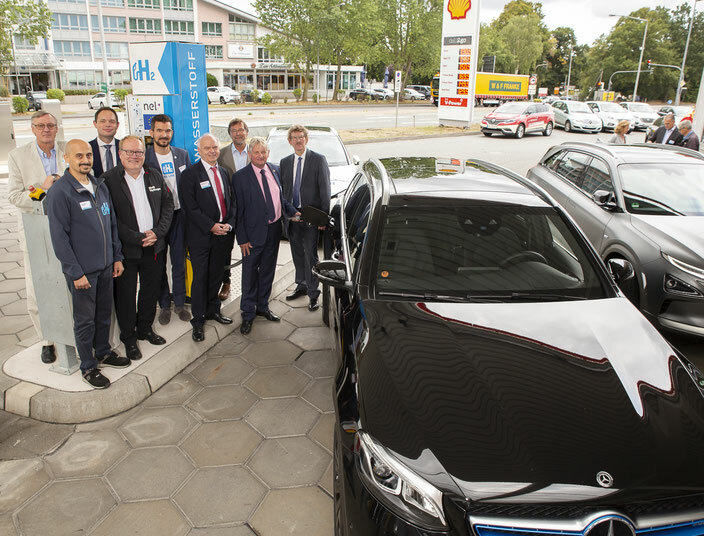 We have only just reached an important milestone with the opening of the 50th German hydrogen station in Potsdam together with our partners from industry and politics, and now Saxony's first hydrogen station marks another important step. Further projects at TOTAL service stations in Leipzig, Magdeburg, Erfurt and Neuruppin will soon enable eco-friendly mobility with hydrogen throughout eastern Germany." "We need to face the challenges of energy transition now. And hydrogen is today one of our best solutions to achieve the objectives of the Paris Agreement. Hydrogen has notably the potential to efficiently decarbonize the transport sector which is one of the major sources of pollution in our cities, but it requires a dedicated infrastructure to achieve this goal. Air Liquide is proud to contribute, together with the key private and public players, to the building of the biggest hydrogen infrastructure in Europe, and thus enable the deployment of FCEVs on the territory." „Hydrogen offers an electromobility solution without restrictions: dynamic acceleration, short refuelling times and ranges comparable to conventional cars. We are delighted that more and more hydrogen pioneers are taking advantage of our fast-growing service station network. There will be 100 stations by the end of 2019! Anyone who wishes, can follow our progress via our app H2.LIVE." 06 September 2018, Ratingen – H2 MOBILITY Deutschland and its shareholders Shell and Air Liquide today opened the seventh hydrogen (H2) station in the German state of North Rhine-Westphalia. By commissioning the station at Brachter Straße 36, the partners take a further step towards a nationwide H2 supply network in Germany. The service station is located directly at the Ratingen Ost motorway junction (A44/A3) in the Essen and Düsseldorf catchment area – so drivers of emissions-free fuel-cell cars now have another refuelling option on the important north-west axis between Hamburg and the Ruhr region. The owner and operator of the new H2 station at Shell Autohof is the H2 MOBILITY joint venture. The filling station technology comes from Air Liquide. The hydrogen station is state of the art. It features intuitive driver-side operation; refuelling is similar to that of conventional vehicles and can be completed in three to five minutes. The facility can hold around 200 kilograms of hydrogen - enough to refuel 40 to 50 vehicles a day. In North Rhine-Westphalia, H2 stations will also be opened at the Shell filling stations in Essen, Dortmund, Mönchengladbach, Leverkusen and Aachen in the months ahead; a similar Shell station has already been open in Wuppertal for two years. Other H2 stations exist in Düsseldorf, Cologne-Bonn, Kamen, Mülheim and Münster. Hydrogen offers an opportunity to expand the fuel supply in the transport sector in a climate-friendly way: Hydrogen produced with renewable energy, can significantly reduce climate-damaging CO2 emissions. The operation of an H2-powered fuel cell vehicle causes neither local pollutants nor carbon dioxide (CO2) emissions. The range of these vehicles is 500 to 800 kilometres per tank of fuel. Markus Schewitza, Managing Director of Air Liquide Advanced Technologies GmbH, adds: “At this point, hydrogen is one of the best solutions for achieving the goals of the Paris climate protection agreement, and has the potential to efficiently decarbonise the transport sector, one of the main sources of pollution in our cities. To turn hydrogen-powered electric mobility into a success story, an attractive range of fuel-cell vehicles and an appropriate infrastructure are required. The expansion of the filling station network is making good progress. A Germany-wide network of 100 stations is to be established by 2019. Including Ratingen, there are already 50 stations where one can refuel with hydrogen." The European Commission is funding a total of 17 facilities – including the one in Ratingen – with a total of 11 million euros in the trans-European Transport Network through its “Connecting Hydrogen Refuelling Stations” (COHRS) project. 31 August 2018, Stuhr – H2 MOBILITY Deutschland, Shell, and Nel today opened Lower Saxony’s second hydrogen (H2) station. In commissioning the station at the Shell Autohof Stuhr - Groß Mackenstedt rest stop, the partners are taking a further step towards establishing a nationwide H2 supply network in Germany. The rest stop is located directly at the Stuhr junction on the BAB 1 motorway, or the Groß Mackenstedt exit on the BAB 28 – in the Bremen/Delmenhorst/Oldenburg catchment area. Drivers of emissions-free fuel-cell cars now have another refuelling option on the important north-west axis between Hamburg and the Ruhr region. The owner and operator of the new H2 station at the Shell rest stop is the H2 MOBILITY joint venture. The filling-station technology is by Nel. The hydrogen station is state of the art, and its driver-side operation is intuitive; the refuelling process is similar to that of conventional vehicles and can be completed in three to five minutes. The facility holds around 170 kilograms of hydrogen – enough to refuel 30 to 40 vehicles a day. Hydrogen offers a way to expand the range of fuels in the transport sector in a climate-friendly way: Hydrogen produced with renewable energy can significantly reduce climate-damaging CO2 emissions. The operation of an H2-powered fuel-cell vehicle causes neither local pollutants nor carbon dioxide (CO2) emissions. Such vehicles currently have a range of 500 to 800 kilometres on a full tank of fuel. Ensuring that hydrogen-powered electric mobility becomes a success story requires an attractive range of fuel-cell vehicles in conjunction with an appropriate supply infrastructure. The expansion of the network of filling stations is making good progress. A Germany-wide network of 100 stations is to be established by 2019. With the addition of Stuhr Groß Mackenstedt, it is now possible to refuel at 45 stations across Germany. 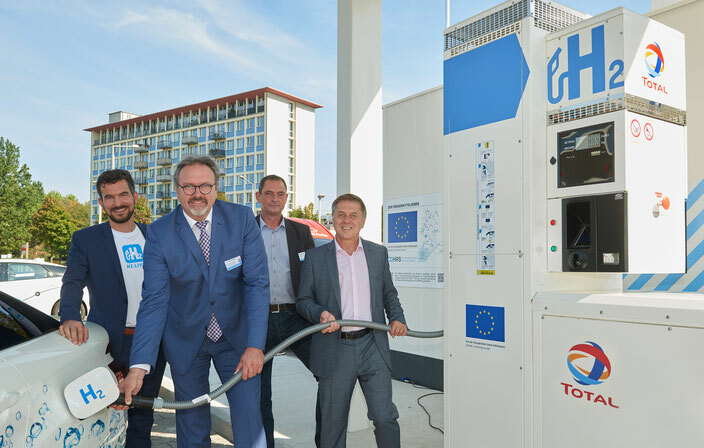 The European Commission is funding a total of 17 facilities in the ‘trans-European Transport Network (TEN-T CEF)’, including the Stuhr station, with a total of 11 million euros, through its ‘Connecting Hydrogen Refuelling Stations’ (COHRS) project. Thomas Zengerly, Chairman & CEO, Shell Deutschland Oil GmbH: "Hydrogen technology is a promising way forward, and hydrogen a fuel that lends itself for clean mobility. We expect that this alternative drive will play an increasingly important role in markets such as Germany, England, Benelux, the USA, and Japan from the 2020s onwards. At Shell, we are on course for this development. "Germany is on its way to becoming a trailblazer in the field of hydrogen-powered electromobility. We are currently building the backbone of the hydrogen infrastructure with the first 100 stations in metropolitan areas as well as along highways and motorways. We are basing the expansion of this network on demand." "It is time to reduce greenhouse gases in the transport sector too. I assume that battery-powered solutions can meet many, but certainly not all mobility requirements in this way. That's why we also need the option of fuel-cell-powered electric drives." "From now on, many drivers will refuel their hydrogen vehicles in our district when travelling from northern to western Germany - we're proud of this, and it strengthens us as a mobility region/centre in northern Germany." "Hydrogen and fuel-cell vehicles contribute to the success of the energy transition, including in the mobility sector. This new offer further strengthens Stuhr as a place of business." June 18, 2018, Kassel-Lohfelden – H2 Mobility Deutschland and its shareholders Shell and Air Liquide have today jointly opened the first hydrogen (in short H2) refuelling station in the Kassel district – the fifth in the state of Hesse. With the refuelling station at Shell SVG Autohof Lohfelden, the partners are taking a further step towards a comprehensive H2 supply network in Germany. The service station is located directly at the Kassel-Mitte intersection of federal motorways 7 and 49, and close to motorways 44 and 38. This now provides drivers of zero-emission fuel-cell vehicles with an additional refuelling opportunity on the important north-south axis between Frankfurt and Hanover as well. The principal and operator of the new H2 refuelling station is the joint venture H2 Mobility, which is establishing a hydrogen infrastructure in Germany. The Shell SVG Autohof is owned by SVG Hessen. The refuelling station technology comes from gas and technology company Air Liquide. The hydrogen refuelling station conforms to the state of the art. Self-service operation by drivers is intuitive; refuelling is similar to conventional vehicles and takes three to five minutes. The facility holds around 200 kg of hydrogen – enough to refuel 40 to 50 vehicles a day. E-mobility with hydrogen reduces CO2 emissions. Hydrogen offers the opportunity of augmenting the fuel offering in the transport sector in an environmentally-friendly way: since with the help of hydrogen, which is produced with renewable energy, climate-damaging CO2 emissions can be considerably reduced. Running an H2-powered fuel-cell vehicle produces neither local pollutants nor carbon dioxide (CO2) emissions. The range of these vehicles is between 500 and 800 kilometres per tankful. In order to turn electomobility with hydrogen into a success story, an attractive proposition of fuel-cell vehicles as well as a corresponding supply infrastructure is required. The expansion of the requisite refuelling station network is making good progress. By 2019, a network of 100 refuelling stations is to be established across Germany. With Lohfelden you can now refuel at 44 stations already. The EUR 1.4 million facility is being supported by the European Commission in the Trans-European Transport Network (TEN-T CEF), in the “Connecting Hydrogen Refuelling Stations” (COHRS) project. "Hydrogen is today one of our best solutions to achieve the objectives of the Paris Agreement. Hydrogen has notably the potential to efficiently decarbonize the transport sector which is one of the major source of pollution in our cities. Air Liquide is proud to contribute, together with the key private and public players, to the building of the biggest hydrogen infrastructure in Europe." “On the journey from the north to the south as well as from the west to the east of Germany, many motorists will in future be able to fill up with us in Northern Hesse – we’re proud of that, which strengthens us as a mobility region in the middle of Germany”. Robert Seeber, member of the Federal Council, Karl Kollingbaum, Mayor of the Borough of Asten, and Wilfried Gepp, Manager of the OMV filling station business in Austria, opened the OMV hydrogen filling station in Asten, near Linz in Upper Austria today. 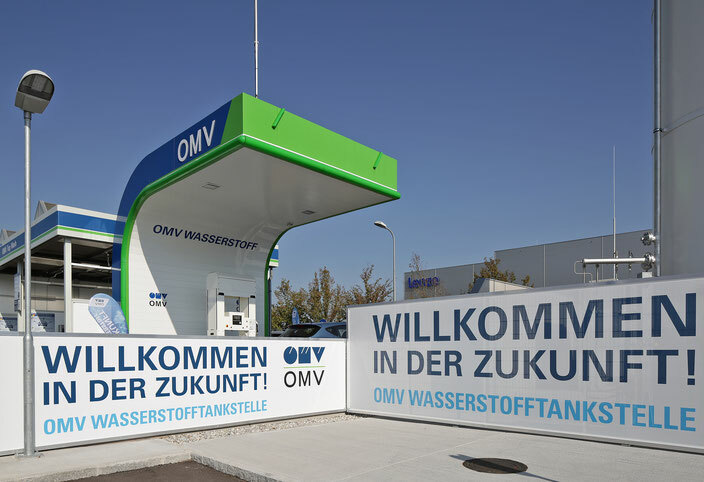 OMV thereby now operates the third hydrogen filling station in Austria. OMV, the international, integrated oil and gas company, headquartered in Vienna, has therefore taken another key step towards readying major European traffic routes for hydrogen on the road. The new filling station is situated directly on the Westautobahn A1 – one of Europe’s most important traffic axes. Officially opened today, the OMV station enhances Austria’s connection to a Europe-wide hydrogen filling station network for vehicles powered by fuel cells. Or follow the OMV blog here.